For decades gigantic automated factory ships have been exploring cosmic space - the universe beyond the reach of weak yet ambitious human beings. From the Earth their owners, immensely powerful corporations, have been stripping every planet of valuable resources. But with the discovery of metallum, the only thing which may make interstellar travel survivable for living creatures, the balance of power is about to shift... dramatically. Now, as the Metallum planetary system has caught everyone's attention, corporate pilots are about to undertake the most important task in the history of our civilization. 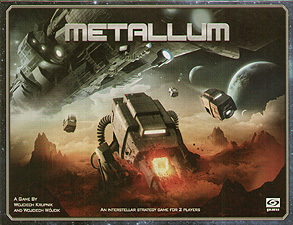 Metallum is a science-fiction game of strategy and planning for 2 players. You take on a role of a corporate pilot who manages one of the enormous factory ships sent to fight for the most valuable mineral in the universe - metallum. Your task will be to construct the most efficient program for your ship. Using the program you will move the vessel through the system, send extraction robots to mine various planets, use ancient installations and purchase the most useful modules. All this to outwit your opponent and dominate the system in the name of your faceless corporate masters. Analyse the situation, program the subroutines and use the Metallum planets to your advantage in this exciting game of stellar war for resources. From the Cold Vastness of Space Only One Victor Shall Emerge!